Yippee! Fresh wet slip. Only on the one jug as the dragons were still too soft but they’ll be getting it tomorrow all being well. 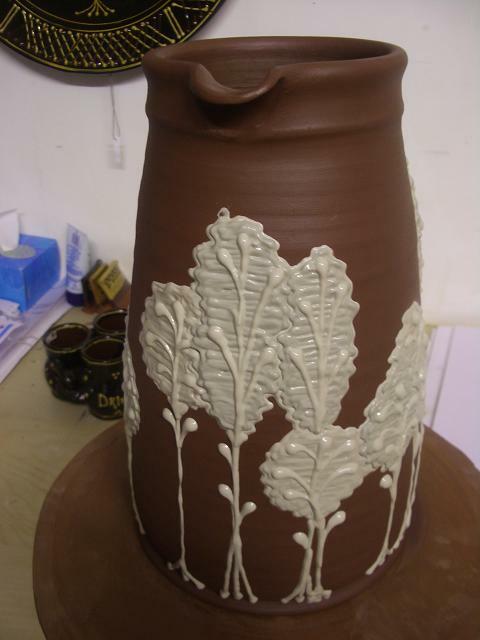 I’ve a couple more of these large jugs which are to be sgraffitoed, one for an order. I had some acupuncture yesterday for the first time, that and traction! (not as scary as it sounded) on my neck. I’ve finally got some physio which is so far going well I think. It feels better even just having now had someone who knows explain what it is and explaining the xrays and confirming that it will get better. Back friday for another treatment. This entry was posted in big jugs, big trees. Bookmark the permalink. That pitcher looks delicious. Reminds me of chocolate with white chocolate decorations. The slip looks great! I can hardly wait to hear about your way of doing things (consistency, timing etc…no pressure!) I am glad you went in for accupuncture. That can really do wonders for pain and healing. Nice slipwork there! Video demonstration sometime in the future? love the deco in the last pic!